View More In Swivels - Page 4. 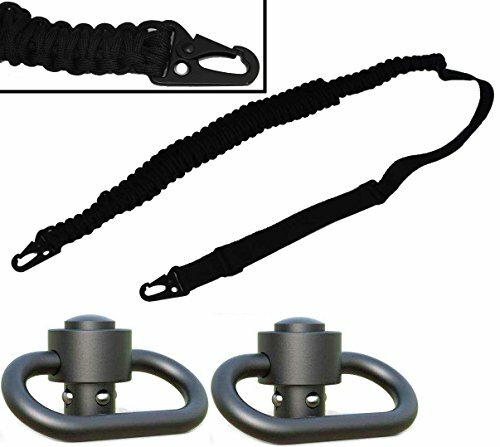 Package Includes: 2 QD Push Button Swivels + 550 lb Paracord Strap. Set of Two QD Quick Detach Puch Button Swivels Steel 1.50" (1-1/2-Inch). Designed for 1.50" Wide or Less. Super Heavy-Duty Push Button Swivels, Will Hold Up To Years Of Heavy Outdoor Use. Quick and Easy Installation. All Steel Construction, Black Finish. Compatibility with a Wide Variety of Sling Types and is Quickly and Easily Installed or Removed from a QD Sling Socket via its large Push Button. Black 550lb Paracord Strap, Material: 58 feet of high quality 7-strand 550LB Paracord (Parachute cord), and 3 feet of breaking strength 100% nylon webbing. Adjustable from 36" Inches to 56" Inches (Approx). Provided with 2 Hooks. Ultimate Arms Gear Two 0.5" & 0.75" Wood Screws Studs Swivels with Spacers + Sling, Black Saiga 7.62/.308/.410/12/20 Ga.